If you’re planning a Disney vacation, you may be considering watching some movies leading up to it, just for fun or perhaps to refamiliarize your kids (or yourself) with the characters. The problem is that there’s SO MANY MOVIES to choose from! If you only have time for some, here are our favorite Movies to Watch Before Disney World. 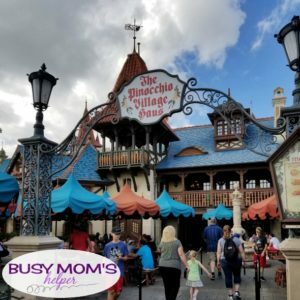 Our family loves doing little activities or things to get more excited (and to help us be patient) leading up to a Disney vacation. Whether it’s decorating our MagicBands, decorating with our printable Disney banner, or doing a cool countdown chart, it’s a lot of fun and helps us make family memories even before we leave on the trip. Watching movies is a must, as well, to get us in the mood – and this year to introduce our kids to new things, such as Pandora land at Animal Kingdom by watching Avatar! 1: Avatar – with the opening of Pandora land a couple of years ago, I knew we had to watch this film just to give my kids an idea of the beautiful sights they have waiting for them there. Not only that, but the Flights of Passage ride will make much more sense! 2: Toy Story – With rides like ‘Buzz Lightyear Astro Blasters’ and ‘Toy Story Mania’, this was already a good pick. Now with the opening of the whole Toy Story LAND, it’s a definite must-see! 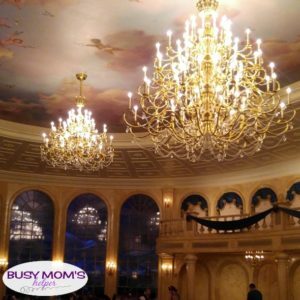 3: Beauty & the Beast – of course there’s Belle around the parks, but especially if you’re going to dine at Be Our Guest restaurant (which I highly recommend! ), this will give you a sense of nostalgia when you walk into the ballroom dining room, and definitely the West Wing. 4: Star Wars – We love ‘Star Tours’ and the like, but now there’s even more experiences and shows with this awesome series! Not only that, but Star Wars Land opens in a year or so, making this even more important to refresh on. 5: The Lion King – My favorite show at Disney World is the Festival of the Lion King, so I wanted to watch this childhood favorite with my family again before we take them to see it. 6: Finding Nemo – This wasn’t one of our TOP priorities, but with a ride for this film that I know they’ll enjoy, we added this to our list. 7: The Little Mermaid – Again, the ride in Magic Kingdom is a fun reason to watch this classic – but also because Ariel is a character you can find in many areas of the parks. 8: Alice in Wonderland – Maybe it’s just me, but I love remembering the film when riding the Teacups! Plus, since this one is a bit older, your kids may not have ever seen it before. 9: Peter Pan – Tinker Bell and Peter Pan are quite popular, as is the ride, so it’s fun to compare the sights you see during the ride to the film. 10: Cinderella – With that big beautiful castle at the center of Magic Kingdom (and particularly if you’re able to nab a reservation at Cinderella’s Royal Table), this is ideal to watch again just for that magic. 11: Frozen – The Frozen ride in Epcot will be much better if you remember the songs and friends in the movie. 12: Monsters, Inc. – Kids will get a big laugh at the Monster’s Inc. Laugh Floor, but if they’ve recently watched the film then it’ll make it that much better. 13: Aladdin – Jasmine and our favorite street rat are quite popular, plus the entire area around the Carpet ride is themed after the film. 14: Tangled – Maybe it’s just me, but the little area by the Tangled restrooms is so pretty – plus those are some of my favorite restrooms! 15: Dinosaur – If your kids will be riding Dinosaur in Animal Kingdom, it may be good idea to have them watch the movie first. Knowing ‘Aladar’ in the cute film might help them not be so afraid in this darker ride! Now, there are plenty more that could go in this list (like Lilo & Stitch, Winnie the Pooh, Sleeping Beauty, Cars, etc.) – because there’s TONS of characters and experiences! These were our top for this particular year, though, and because we had to prioritize due to time (as much as I’d love to rewatch every Disney movie ever made each year, that’s just not realistic). What’s your favorite movies to watch before Disney World? Y’all know I absolutely LOVE to travel – near or far, it’s so exciting to make plans, pack, check out new sites and meet new cultures! 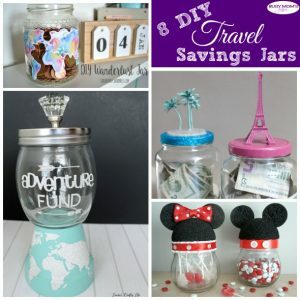 Whether you’re planning a trip to Disneyland, dreaming of an escape to Paris or have no specific destination in mind – just the desire to travel – then these 8 DIY Travel Savings Jars are for you! I don’t know about you, but I think having a cute jar where you can store loose change or other funds you want set aside for a future trip makes it more exciting – and even a little more REAL! This can be especially great if you have a LOT you need to save up to reach your desired goal. It can also be a way for the whole family to get involved – if the kids see that mom and dad are putting some spare change into the jar for the family’s trip, perhaps they’ll want to contribute as well. Check out these awesome DIY travel savings jars and pick one that works best for YOUR future adventure! Whichever travel savings jar you choose, or wherever you go, I hope you make wonderful memories to last a lifetime! As many of you know, the past two months have been a chaotic mess of moving from one house in a hurry, finding a new house at the last minute because our original pick fell through, then having almost a week when we were between houses before we could move in. So what do you do when you’re living between moves? Find a fantastic home-away-from-home, of course! Seriously, I never want to deal with all the rushed packing and storage, extreme late nights to get it all done in time, or the emotional toll this has been on is. That being said, last week when we were between houses went much more smoothly than I could have imagined being temporarily homeless! Luckily, we were able to get a 2-bedroom suite at a local Extended Stay America that worked perfectly for our big family! The kids weren’t quite sure at first about staying at a hotel for that long while still doing school, but as soon as we came in they LOVED it and were really excited. The great thing about an Extended Stay America is that the rooms come with kitchens, so you can still make meals as needed. This was perfect for the early morning breakfasts before school, then making the kids a tasty dinner after all the kids’ activities. It was also a great benefit because we had a place to store our fridge items while our own fridge was in storage! We didn’t have to bring our own dishes, as they supplied what we needed – just let them know, and the friendly desk staff will help you out. One bathroom was a little weird for our family of 7, but it worked out fine for the week. It was a good size, plus had plenty of storage for our stuff. They had no problem supplying all the towels we needed, either. The front room had TWO queen/full sized sofa beds, which our girls enjoyed. Keeping them separate form their brothers was a definite sanity-saver, since they’re ‘too cool’ to share with their younger siblings apparently! They fold up nice and easy, leaving it a great family room with little table and TV. Behind that was a table that made it great for me working during the day – blogging never sleeps, after all! The free wi-fi was a blessing, and during the day the speed was just fine. The smaller of the bedrooms, which the 3 boys shared, was to the side and had a closet that fit all their stuff. The master room was in the back of the hallway, with a comfy bed and TV. The closet was surprisingly HUGE, which was perfect as we did have several pieces of luggage and other things we didn’t want in storage while we between houses. …and soaps, shampoo and dish detergent to make your stay feel right at home. For how hectic the past several weeks have been, I’m so grateful that our time at Extended Stay America while between moves took some of the stress and chaos off of our family. It was like a wonderful mini vacation between everything, and helped us all unwind, relax and enjoy our time a bit more! How do you deal with being between moves? For those that don’t know, our family is working extremely hard to be able to go visit Disney World later this year – that means saving money, planning ahead, skipping on some ‘extras’ to make it a reality. We’re all on board, and doing little things along the way to keep us excited and the momentum going – such as planning how we’ll customize our MagicBands! 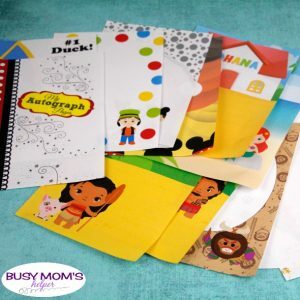 This is a great way to personalize your own band, and can be a fun Disney-themed craft project as you’re preparing for your next trip. 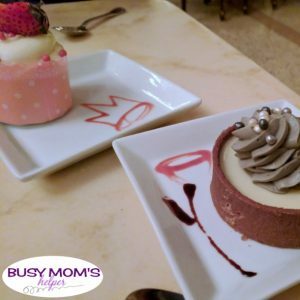 Here’s 5 Awesome DIY Disney MagicBand Decorating Ideas to help get your creativity going! 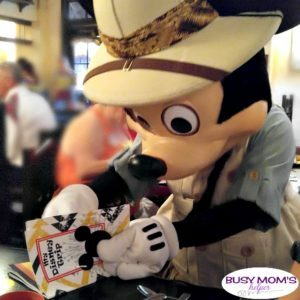 If you saw when I shared earlier on why I think MagicBands are completely incredible and super useful on a Disney trip, you’ll know many of the ways you use it at the parks, hotels and more. Well, now you don’t only have your own handy band to help along your trip, but you can personalize it however you want to REALLY make it yours! Plus, it’ll add a little bit of ‘magic’ while you’re planning, preparing and counting down to your next visit. Don’t forget to check Get Away Today for the best Disney Vacation deals! You can order fully designed/printed MagicBands from Disney – everything from classic characters, to superhero or Star Wars. There’s also some fun accessories from places like the Disney Store that just pop into the holes along the band for some 3D accents. Okay, how awesome is this Captain America themed band from Creative Green Living? Head over to see how she used paint to customize hers! Check out how simple it is to use a fun tattoo for your MagicBand at Disney Insider Tips. How fantastic is this beautiful jeweled MagicBand from The Delightful Life?! I totally love it – this plus the ‘bonus’ craft at the bottom are likely what I’ll do to customize my own this year! 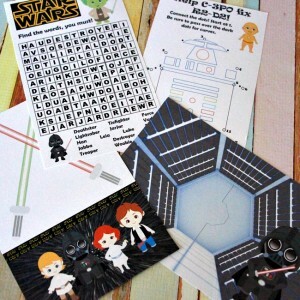 More fun ideas on the blog at Get Away Today! There’s so many possibilities when you have some nail polish on-hand, so check out ScrapPop for how to use it on your band! I absolutely LOVE this MagicBand creation from Creative Green Living – not just because it’s sparkly, but it’s also purple! I want to mix this tutorial with the jewel/bling one on my own band for our trip – I’ll be sure to share pics when it’s done! 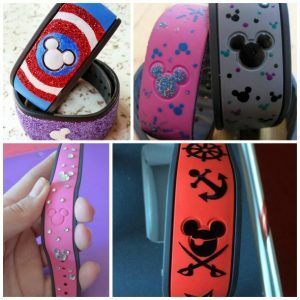 How would you customize YOUR MagicBand?